Taste of the Nation is the epitome of a charity gala. 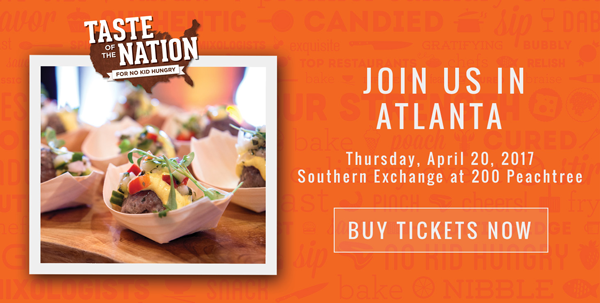 Join us on April 20 for Atlanta’s Taste of the Nation supporting No Kid Hungry. This incredible nonprofit organization is dedicated to providing free or subsidized meals for thousands of children across the country. Taste of the Nation events donate 100 percent of their proceeds directly to the cause. For every $10 you donate provides 100 meals to children who might otherwise go hungry. More than 30 U.S. cities will host their own Taste of the Nation event, but we think here in Atlanta ours will be the best. Join the city’s finest chefs, sommeliers, and mixologists for a remarkable night of dining in support of No Kid Hungry’s work to end childhood hunger in America. Celebrating its 29th anniversary, the event will take place on Thursday, April 20, in a brand new venue, Southern Exchange at 200 Peachtree, featuring more restaurants, more chefs and more surprises including an intimate VIP Dinner Experience. Leading the 2017 event along with our Event Chairmen, Pano Karatassos and George McKerrow, is Honorary Chef Cat Cora, TV personality and restaurateur, and Honorary Chair Chris ‘Ludacris’ Bridges, Entertainer, Restaurateur and Partner of Chicken + Beer. No child should grow up hungry in America, but one in four children in Georgia struggles with hunger. Share Our Strength’s No Kid Hungry campaign is ending child hunger in America by ensuring all children get the healthy food they need, every day. During the summer of 2015, more than five million summer meals were served to kids in Georgia, and the state was among the worst in our country that increased summer meals participation. Since Share Our Strength launched the No Kid Hungry campaign, we’ve connected kids nationwide with half a million meals! Need another reason to come? Taste of the Nation is also black-tie optional so ya dress fancy, sip cocktails, and nosh on yummy tastings to help put food on the table for needy kids. Yes, I know this sounds bougie, but Taste of the Nation is seriously one of the best events I’ve been to in this town. Also, we’re doing a blogger giveaway! Anyone who purchases tickets will be entered in a raffle for a $100 Buckhead Life Restaurant Gift Card. That’s a nice lunch for 4, or fancy dinner for 2! Tickets are $175 each using my promo code LAURENPATRICKNKH. Please let me know if you can make it, need additional info, etc. Let’s rock Taste of the Nation for No Kid Hungry!